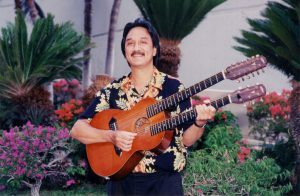 A longtime member of the Musicians’ Association of Hawai’i, George Kuo is an exquisite, but underrated, slack key guitarist whose reach extends far outside the islands. For those who’ve experienced him live, Kuo truly embodies the voice, or Ka Leo, of Hawaii. 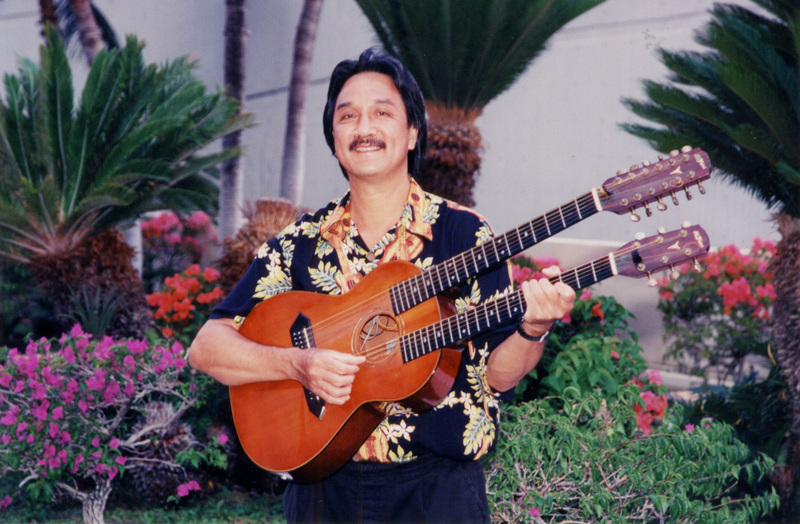 His exquisite voice and slack key touch, often on double-neck guitar, overflow with the true aloha spirit. Locals and visitors flock to his shows, whether they take place in Waikiki, the Hollywood Bowl, or a week-long music festival in Bordeaux, France. A fierce advocate of traditional Hawaiian slack key, based on the nahenahe, or gentle, soothing style, Kuo plays what he feels, and he feels deeply. As gentle as a summer tradewind and full of aloha, his music — and voice — go beyond the notes and the time signatures, to the heart. That connection is what always draws a crowd to Kuo’s shows. His music is a quiet, living testament of the aloha that cannot be ignored or set aside. It’s the aloha people associate with the real Hawaii. For a beloved artist who has touched so many lives, the highlight reel contains an embarrassment of riches. “I am amazed at how blessed I have been from God in my musical career and in my life outside of music,” he marveled, looking back at the arc of his life. Once Kamae invited Kuo to join the Sons of Hawaii, the world opened up, especially on shows with the Honolulu Symphony. Kuo experienced so many awesome performances with the Honolulu Symphony at some pretty big deal venues, the Neal S. Blaisdell Center in the heart of Honolulu, Waikiki Shell, and Hollywood Bowl among them. Kuo was instrumental in helping pianist George Winston put together the Hawaiian Slack Key Guitar Masters series, beginning in 1995. Kuo appeared in the first volume, along with other Hawaiian stars, such as Cyril Pahinui, Sonny Chillingworth, Keola Beamer, and Ray Kāne. The masters series became a huge hit locally and nationally, putting Hawaii musicians on the map. And then there’s the time he won two Na Hoku Hanohano Awards — the equivalent of the Grammys in Hawaii — for his 1995 Hawaiian Touch album and Aloha No Na Kupuna – Love for the Elders the following year. Most recently on Nov. 13, Kuo had the great pleasure of bringing his special kind of aloha to the Pacific Northwest at the 8th annual Hawaiian Airlines Seattle Slack Key Festival, along with other island artists. “Performing at the Seattle Slack Key Festival was so satisfying and fun. The Mainland audiences are so appreciative, because you are giving them the warm aloha, soothing, beautiful feelings that they can only get when they are visiting Hawaii,” Kuo explained. The slack key icon first joined the musicians union in 1980 at the beginning of his career, and has served on the Board of Directors since April 2015. His primary platform is to bring back more of an appreciation for the traditional Hawaiian music he enjoys playing. Through legislative action and education, he hopes to open up venues and minds — just like they did in New Orleans — to the enormous value of local music and local musicians. “Being on the Board has given me much insight on the difficulty of sustaining the business of the Musicians’ Union and how musicians are affected in today’s adverse business climate,” Kuo said. Kuo has been around long enough to see traditional Hawaiian music dwindle down to a footnote, especially in the tourist mecca of Waikiki, as bottom-line businesses try to emulate the generic big cities outside of the islands. Even worse, he’s watched too many talented musicians trading in traditional Hawaiian music for whatever sells, and long-timers giving up on their dreams entirely for a nine-to-five job to pay the bills. Kuo recently wrapped up his own 18-year gig at the Waikiki Beach Marriott with Martin Pahinui and Aaron Mahi. People come to Hawaii to enjoy all that is Hawaiian, Kuo contended. His own traditional slack key music is living proof. George Kuo conjures spirit of Hawaii in “Wai’alae,” a classic tune written in 1919 by Mekia Kealakai.